The best games of SHUX 2017! Paul: It feels so very, very strange to be doing this. 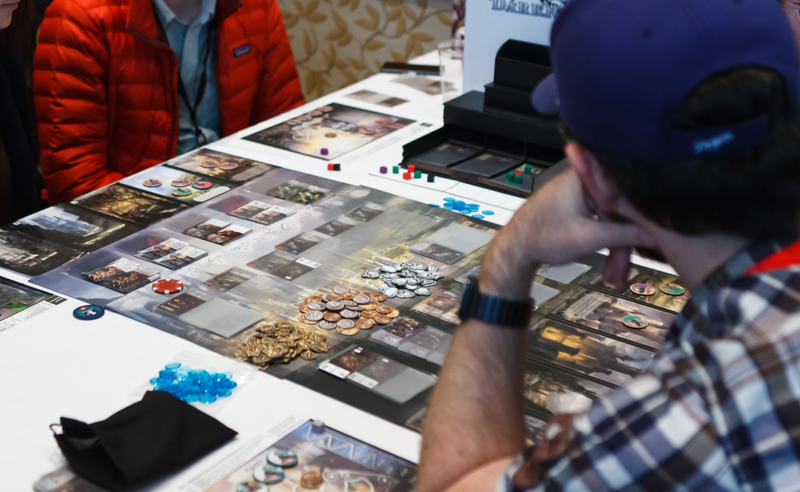 We’re always writing post-con roundups, flying home and tapping out our thoughts on the best new games we tried, but to do that after our own con? It feels a little peculiar, like the first time a doctor shone a light into my ear. But that’s a proper, sensible thing that doctors do, right? It’s not just for giggles? Matt: At the time, it was straight-up stressful! We hadn’t accounted for the fact that people might be showing off things we really wanted to look at, so we frantically juggled schedules to try and check stuff out. There was still so much we missed, but we caught some REAL GOOD BITS. Paul: For a start, Matagot only went and rolled up with an Inis expansion that they just casually announced IS A THING THAT EXISTS? Matt: That was the double-take moment. The con already felt like an unreal dream before we tripped over an expansion for what might be one of my favourite games. It’s soppy, but I think one of many reasons that Inis has a special place in my heart is that I found it the same way that a lot of other people did: I watched the review on Shut Up & Sit Down! The enthusiasm was infectious: I pre-ordered it, I loved it, I continue to love it. My immediate impression: do I really need this? The base game has no obvious problems that need patching and elegant designs rarely benefit from additional ingredients. But, based on how well Inis adapts to being played with 2, 3, or 4 players, it’s impossible to resist the lure of a fifth and the expansion stirs a clan of black plastic celts into the mix. You’ve also got new Season cards, the cards that represent your actions, OH BUT HEY, a major new addition is the inclusion of actual seasons too (Winter, Summer, Artichokes, Ham). Each season slightly shifts the game’s rules – in Summer for example, any card can be used to trigger movement! Make war while the sun is shining, etc. You’ve also got 20 new Epic Tale cards and a bunch of new locations to stroll about in. Oh no! These locations are WET. These tiles have ports on one edge that you can’t explore beyond. Because it is the sea. But! Any two port tiles are considered to be adjacent. 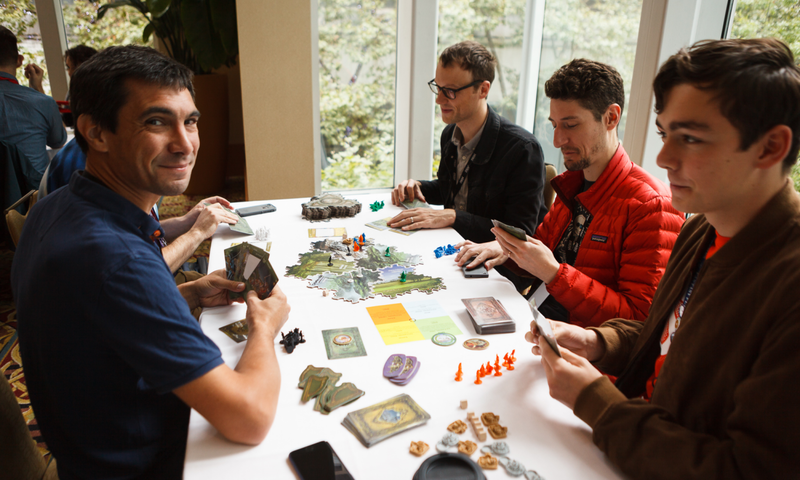 We barely got a chance to toy with this expansion but, if it nails five players, then I’m absolutely sold. 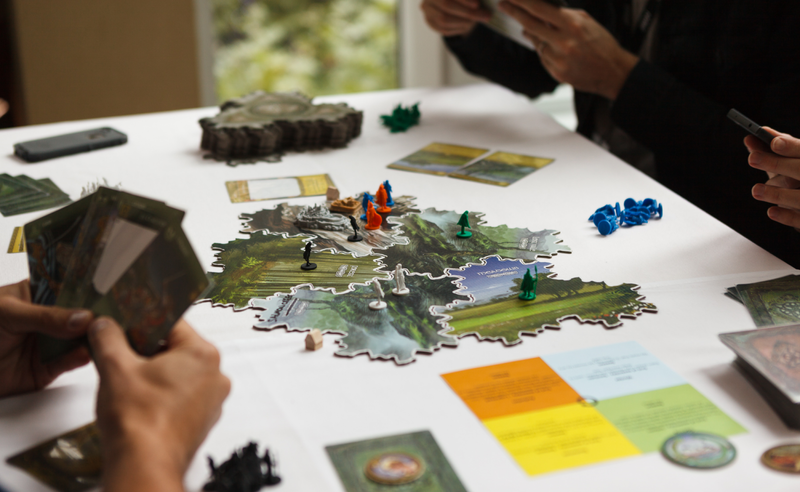 We also nabbed some really fun trivia about the art for Inis while we were playing, but that’s perhaps a podcast story for another day! Paul: You’re a tease. Trying to pick my best new game of SHUX is like trying to pick a favourite twin: I’m only going to upset someone and also upset myself. Yet here I go anyway: When I Dream was, without doubt, the game I most connected with right away. It turns out that a tableful of people trying to either explain or obscure simple concepts to one another is, in fact, terrific. Sorry, you only get one guess! A new card is drawn and guessing continues until time runs out. Correct guesses score points for the helpful Fairy team, while incorrect guesses score for the rival Boogeymen. The dreamer scores if they correctly recall their guesses (increasingly difficult the more they make) and also in the mix is a Sandman who wants both sides to tie, meaning they may switch from being a help to a hindrance as the round goes on (in practice, they almost immediately end up siding with the losing team early on to try and even things out). A new dreamer puts on the mask, all the roles are reshuffled and everything begins again. While it might sound like a game of shouting and chaos, it’s actually a very ordered and thoughtful affair, with both dreamer and clue-givers wrestling with their imaginations as they try to find just the right (or just the wrong) words. It ends up being baffling, it ends up being ridiculous and it ends up being very funny. 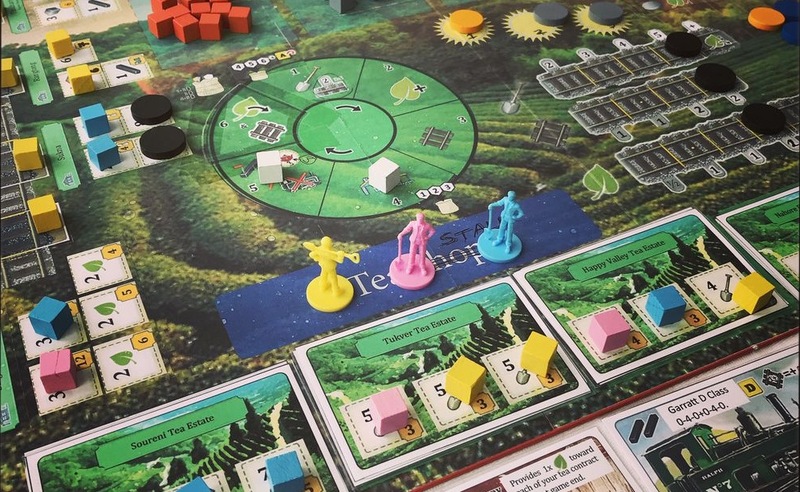 Matt: I really enjoyed the time I spent playing a few new games by John D. Clair – who appears to be quite frighteningly busy. 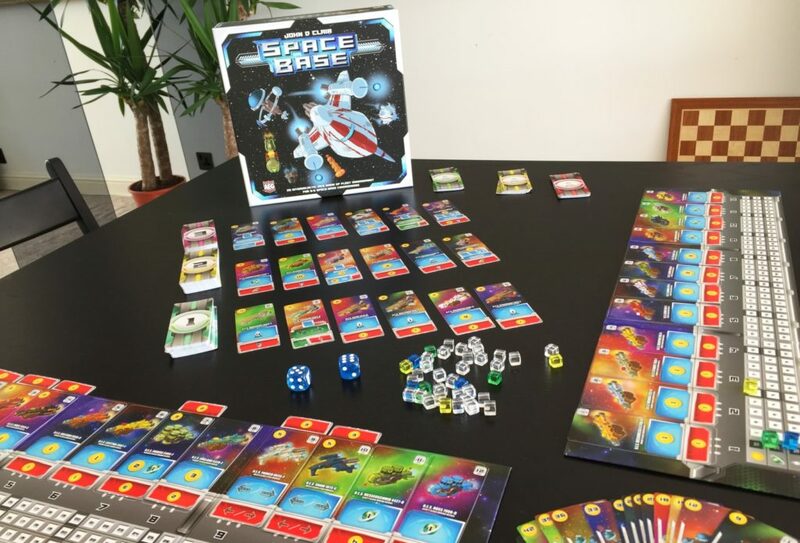 Space Base was something I briefly talked about on our live SHUX podcast (audio & video online soon-ish). It’s basically a fiddlier version of Machi Koro in which you build a fleet of tiny spaceships. It was simple, fast, and I’m surprised how much I liked it. 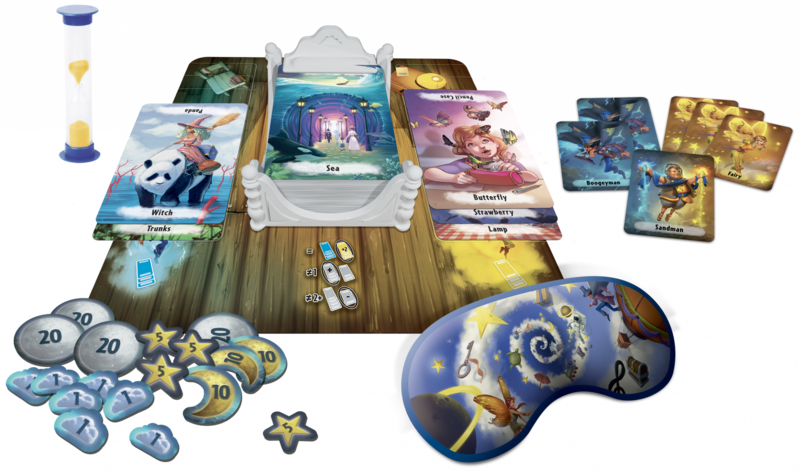 I wouldn’t say it was wasn’t charming, it didn’t often feel like it matched mechanics with theme, but the flow was fast, the decisions were interesting and I’d very happily play it again. 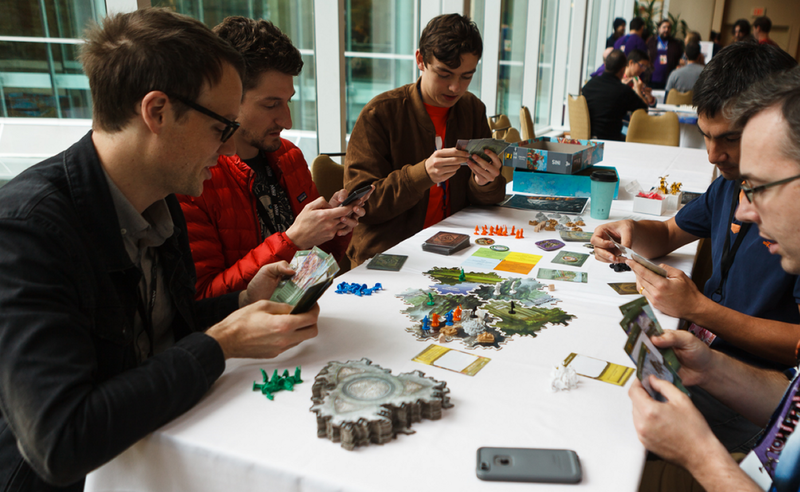 You hold a small number of cards, slotting in upgrades that are paired to ten related locations, all chosen randomly at the start of the game. And gosh, there’s a lot of things you can do. You’ve effectively got four different economies to juggle: workers, untrained workers, gold, and influence. Building cards that properly activate your point-machine isn’t too tricky, but these cards… aren’t actually yours. All of the cards end up in one deck, which all players draw from. So other players frequently pick up your cards, which they can then use just as you would providing they pay you for the privilege. After that, the cards go to one side and are guaranteed to be part of your hand in the next round, which is pretty handy for pre-draft planning. There’s something delicate about the careful process of building cards that you want, but that other players will want to use too. Oh, and the monsters that attack the city are the reverse side of these constructed cards, which means they get tougher as you all build better cards, and that your cards might also end up briefly stuck in monster land. And there’s a tower that randomly drops coloured cubes onto the monster cards to decide who they attack. That’s fabulous and ridiculous, did I mention that? It seemed like a sumptuously silly smorgasbord of stuff, but for a game about politicking to control a city, I enjoyed the blur of rough luck and wild opportunism. I’ll be fascinated to pick Quinns’ brain once he’s back, as he didn’t seem to enjoy it quite as much as me. Having said that, I DID WIN THE GAME. Paul: Important. If there’s one thing I’ve learned from all these board games over the years, it’s that winning is all that really matters and this is why I must devote all my time and energy to mastering Meeple Circus. After expertly constructing so many towers of mismatched wooden detritus in Junk Art, I should be a master of meeple-stacking. But I am not. Balancing elephants is hard. 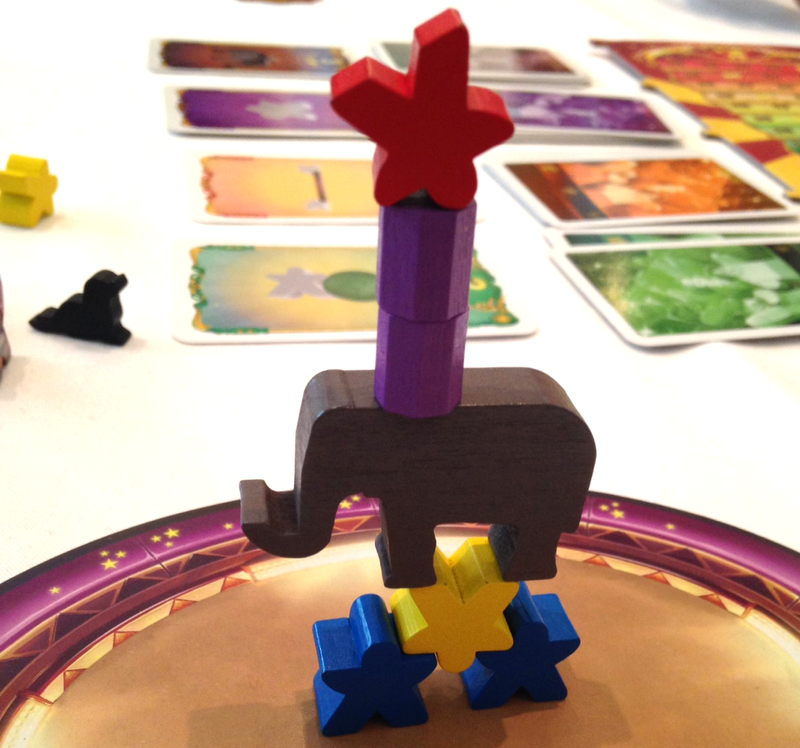 Meeple Circus was one of the games that had me salivating like a Pavlovian puppy and it did not disappoint. 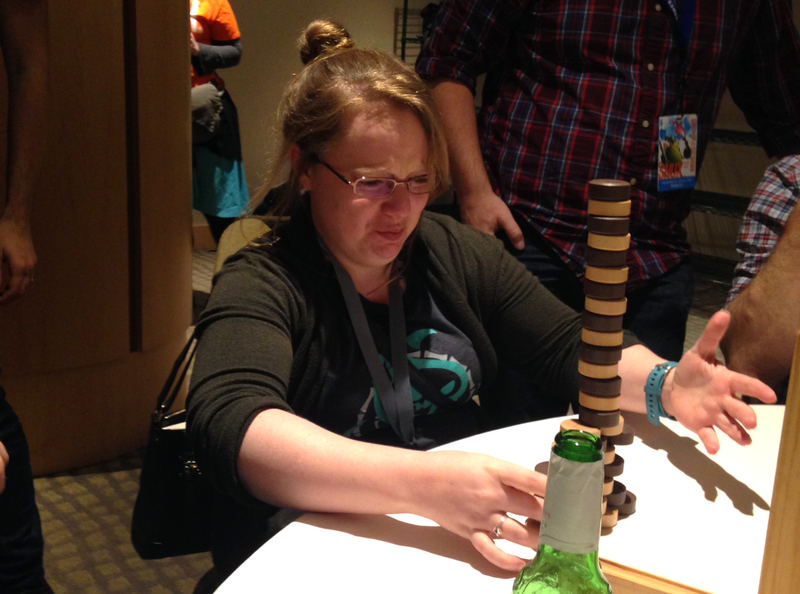 Yes, it’s a dexterity game, but it’s about a lot more than just piling pieces. Each of the three rounds, you and your rival ringmasters choose cards that add new animals and acrobats to your circus. Then you stack them up, against the clock, and while height can be helpful, what really matters is arranging everything according to very specific victory criteria: Can you balance a barrel on an elephant, turn an acrobat upside-down or have on performer hold up a plank with another performer on? Against the clock? While doing a drumroll with your other hand? 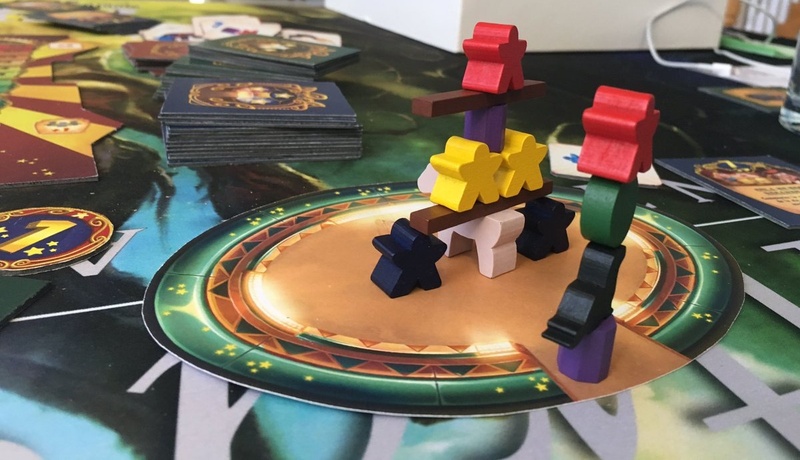 Matt: Sometimes a video is worth a thousand words, so we’ll have a Let’s Play of Meeple Circus very soon, giving you a chance to see just how difficult those elephants can be. The final grand surprise was Mike Selinker popping up to introduce himself and calmly asking if we’d like to play the new expansion for Lords of Vegas, which had never been seen in public before. Not so calmly, we replied: “yEsSs”. This modest addition adds a new deck of cards and serves a similar purpose as the UP! 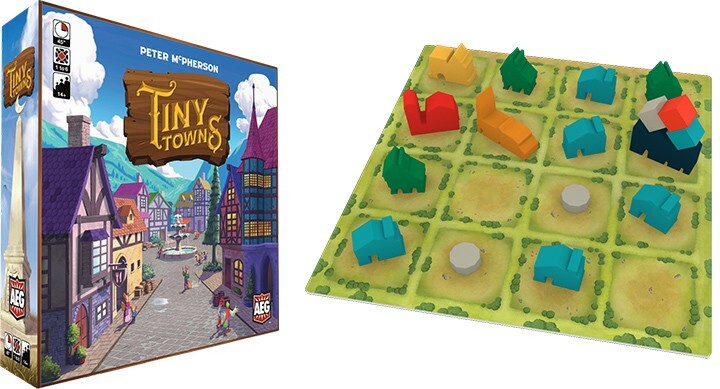 expansion, ensuring that the game continues to offer players interesting choices all the way through, while avoiding situations where everyone ends up with just too much cash. Mike explained that the expansion has been designed to be both small and cheap, so that it’s accessible to everyone. This deck of cards represents a cycling shop of stuff that players can choose to buy before they draw a location card at the start of their turn. Some of the cards offer immediate points, whilst others offer points at the end of the game. If you’ve never played Lords of Vegas, then congratulations, you’ve just activated the Quizzlestick Bonus-Bumper Round. Buying points is a little boring, but most of the other cards are fun: $5m for a chance to roll two dice and take that many million from the bank? Could be bad, could be tasty. A card that lets you remodel on the cheap? Hello Madam Money, welcome to Vegastown. I get $10m right now, but have to pay $2m every time a purple card gets drawn? Well that’s fine, isn’t it? That’s almost definitely probably fine. A card that lets you re-roll ANY THREE DICE on the board? Sorry, what? The Lords of Chaos are on the phone and they’d like to make a reservation. 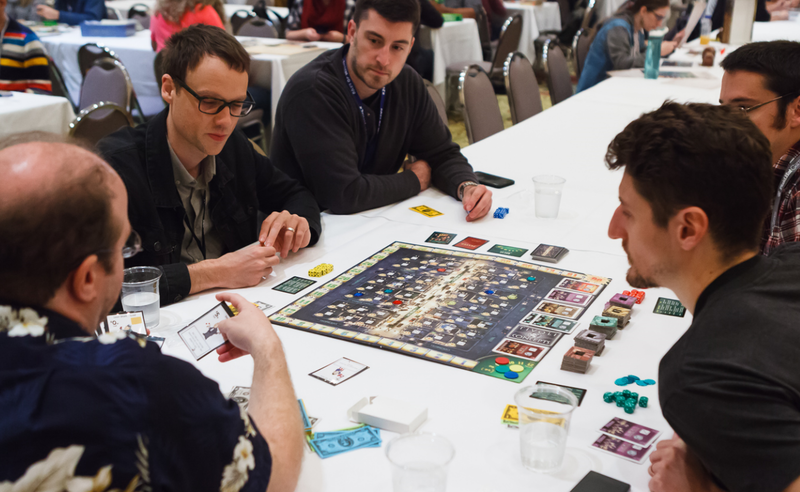 We played a whole game with the help of two brothers who’d attended SHUX together, and it was a fantastic reminder of how much this game shines when garnished with a touch of lifelong rivalry. Shout out to the younger brother, who had to go home from SHUX slightly early on account of the fact that his wife went into labour. 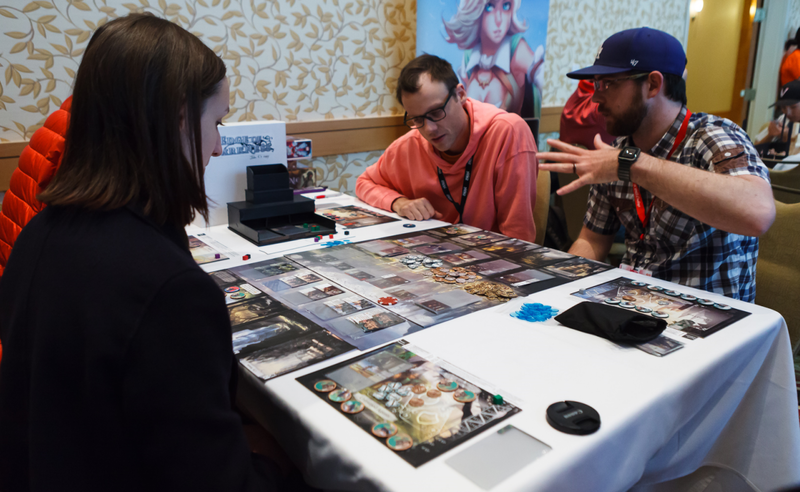 Some people might argue that you shouldn’t have even been at the convention, but in our hearts I think we both know that it really was a very good game of Lords of Vegas. 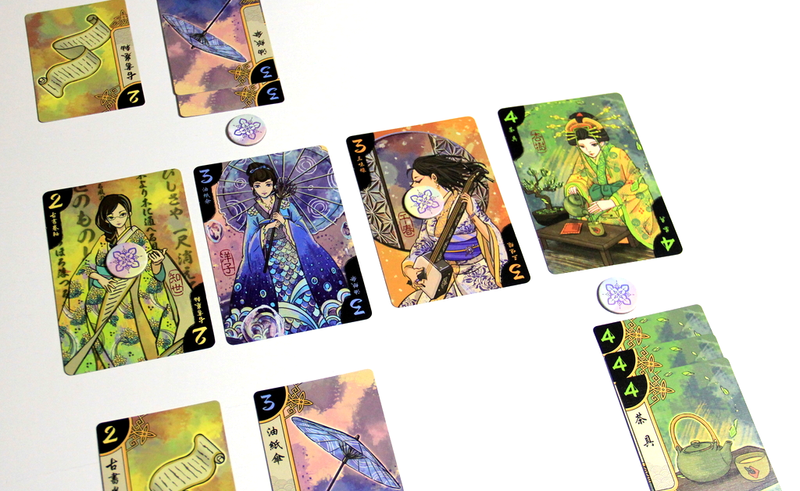 Paul: I can’t boast a story anywhere near as dramatic as that, so instead let me tell you about the serene beauty of Hanamikoji, a wonderful card game that was quietly doing the rounds thanks to special guest Jonathan Ying. Jonathan wanted to spotlight more work by women and designers of colour, introducing me to this game during a quiet moment on the last day, and I was hugely impressed. 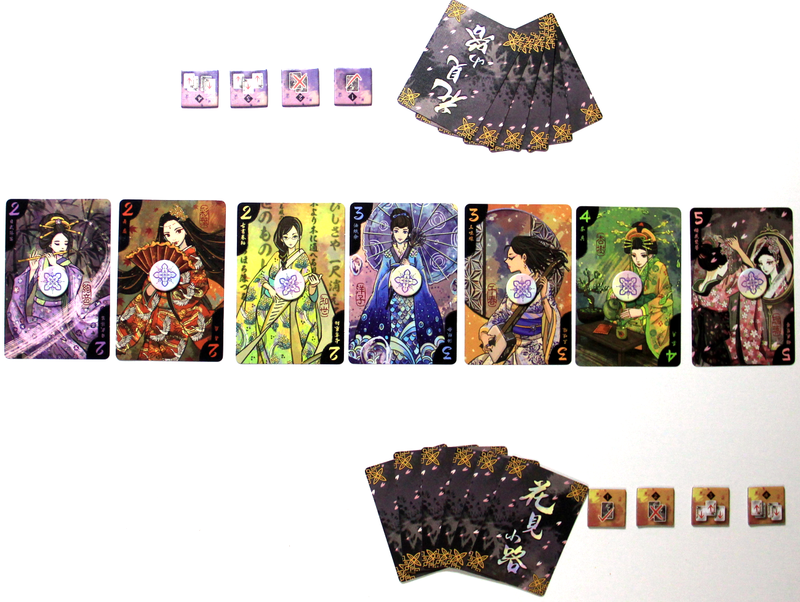 The work of Japanese designer Kota Nakayama, Hanamikoji is an extremely tight and precise two-player game about trying to employ geisha by playing cards that offer them gifts. Every card is a gift of some sort (umbrellas, instruments, tea) and if you can play more cards of that type than your opponent, you win the interest of the geisha they correspond to. The challenge isn’t just that there are different numbers of cards corresponding to different geisha gifts, but that each of your four turns has you playing cards in a very specific fashion, only for that turn. For example, you might lay out three cards and let your opponent pick one, before playing the other two. Then you might make two stacks of two cards, your opponent choosing one and you choosing the other. Both of you only get to do these things once and, each time, you’re carefully counting the cards you have, trying to work out what you can afford to give away and what you must keep to win a majority influence over four of those seven geisha. And it’s so hard, so precise and so tightly designed that I reckon it might be more waterproof than a wetsuit. It’s wonderful. Matt: A penultimate shoutout to Kurtis Wiebe’s custom Rat Queens D&D adventure “The Hangover,” which we were incredibly lucky to get a chance to play through LIVE. I say “incredibly lucky,” but, honestly, it was nerve-wracking! Trying to play through an adventure as characters created by the DM would have felt horribly intense had Kurtis not been a very lovely man. The adventure was a lot of fun and you can download and try it yourself… or wait and watch SU&SD and friends playing through it a video that will surface online in the next few months. 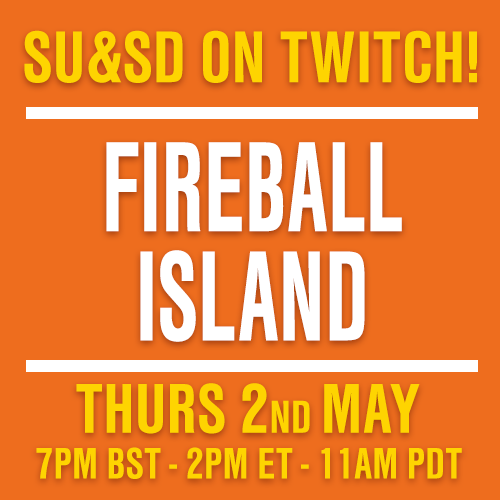 We’re keeping the timeline for SHUX videos vague at this stage, but gosh, I think you’ve got some interesting and fun things to look forward to in the future! Paul: One final nod to Ed Gass-Donnelly, who insisted on bringing the ridiculous Wallamoppi along. Hardly new, but nevertheless wonderful, Ed describes it as sixty-second Jenga and I can’t think of a better label for this speed-stacking game. You and a friend-soon-to-be-enemy take turns removing your pieces from a pyramid of wooden blocks, stacking them back onto the top, but you only have as long as it takes a marble to scuttle its way down the game’s wooden box. Special thanks to Frank Roberts, who took so many of these excellent pictures, as well as Denis, who taught so much Inis this weekend he might as well be an Epic Tale himself. We’ve still got lots of photos coming in, so we may update this post with more as and when they arrive!